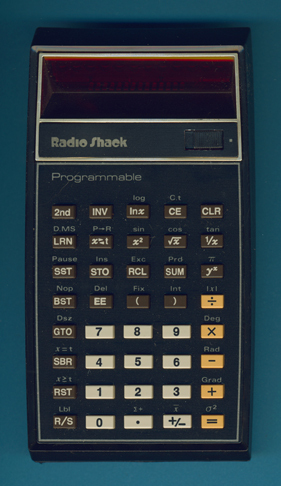 The Radio Shack EC-4000 does not only look like an early TI-57 Programmable, it's 100% identical. Please notice that Texas Instruments used in Italy a simple sticker instead the molded TI-logo and TEXAS INSTRUMENTS nameplate found with the US-built TI-57 Programmable. Dismantling this Radio Shack EC-4000 manufactured in 1979 reveals a well-known printed circuit board (PCB) with the impressive TMC1501 single-chip calculator circuit.